The Significance of Modern Israel? "Also I will restore the captivity of My people Israel, And they will rebuild the ruined cities and live in them, They will also plant vineyards and drink their wine, And make gardens and eat their fruit. I will also plant them on their land, And they will not again be rooted out from their land Which I have given them," Says the LORD your God (Amos 9:14-15). The modern state of Israel is under attack, not just from the Muslims, but increasingly by so-called Evangelicals, especially among those who are thirty-five and younger. A generation ago, it was virtually synonymous to be pro-Israel and Evangelical, however, with the arrival of so-called "postmodern Christianity" it has become more important to be relevant to the pagan culture than to be biblical on issues. And increasingly the world is finding reasons to oppose Israel at the same time when that same world is increasingly becoming more anti-Christian. All throughout the Old Testament God says that the land we know as Israel is for the physical descendants of Abraham, Isaac and Jacob, or the Jews. Every Old Testament prophet, except Jonah, speaks of a permanent return to the Land of Israel by the Jews. Nowhere in the New Testament are these Old Testament promises ever changed or negated. In fact, they are reinforced by some New Testament passages. Walter Kaiser notes that "the writer of Hebrews (6:13, 17-18),...swore by Himself when He made the promise: to show how immutable His purpose was." Paul says of the promises to Israel: "for the gifts and the calling of God are irrevocable" (Rom. 11:29). The only legitimate basis for the Jews to claim a right to the land of Israel comes from the Bible. In fact, if it were not for the biblical history of Israel who would even know to associate the Jewish people with the land of Israel? It is precisely because God associates the Jewish people with the land that He gave them—located in today's Middle East—that we could even have a movement today known as Zionism, whether from religious or political motives. Detractors of Zionism must attempt to say that God's promise of the land of Israel to the Jews has somehow been invalidated. My how many have tried down though the years to prove just that! But God's word speaks louder than their shrill voices combined. This cannot be proven from an inductive interpretation of the Bible, Old or New Testament. The most popular argument in our day is to say that somehow Jesus disinherited the Jews from their land because He brought salvation to the Gentiles and the Church. How silly! The case for Zionism rises or falls upon what the Bible teaches about Israel and the land of Israel. It is true that a just case for Israel can be presented upon many grounds, but ultimately it boils down to what does God think about this matter as communicated through His inerrant and authoritative Word—the Bible. The Old Testament speaks of two end-time regatherings of Israel. The first one is occurring now before the tribulation as the Jews return to their land primarily in unbelief. Why are they returning in unbelief? They are returning in unbelief since the purpose of the tribulation (the 70th week of Daniel) is to lead to the conversion of the nation to belief in Jesus as their Messiah. Thus, one must be an unbeliever in order to become a believer as is the biblical purpose for the tribulation for the nation of Israel. The other end-time regathering will occur after the nation has converted to belief in Jesus as their Messiah, at the second coming. Before the events of the tribulation can happen, Jews from all over the world must return to the land, just like we see happening with the modern state of Israel. This, of course, does not mean that every Jew in the world has to be back in the land. But it does clearly mean that many of the Jewish people must return to their ancient homeland for their to be a nation in order to fulfill these foreordained events. End-time prophecy in Scripture is built upon the assumption that Israel is both regathered to her land and is functioning as a nation, just as we see happening in the modern state of Israel. It also appears that Israel must have some degree of control over Jerusalem since her Temple will be rebuilt by the mid-point of the tribulation. Also, the two witnesses that will appear in the first half of the tribulation appear to carry on some of their activities within the vicinity of this rebuilt Temple. To summarize, then, the logic goes like this: The tribulation cannot begin until the seven-year covenant is made. 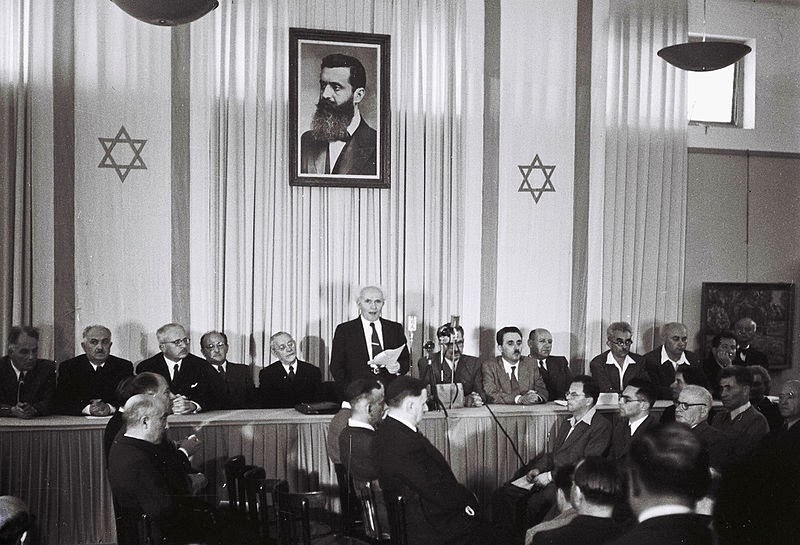 The covenant cannot be put into place until a Jewish state exists. Therefore, a Jewish state must exist before the tribulation and the modern state of Israel has been brought back into existence in order to fulfill that role. As a result, the stage is set for the very event that will trigger the tribulation and usher in the final days of the world as we know it. Much to the disappointment of those who are opposed to Zionist theology, the modern state of Israel is in just such a position. This truly indicates that we are near the end of days. This December we are going to have one of the most significant Pre-Trib Study Group Conferences in our twenty-two year history in the Dallas/Fort Worth area. This year's conference will be focused totally on why the modern state of Israel is prophetically significant and is clearly part of God's prophetic plan. If there ever was a year to attend our conference, this will be it. We have lined-up some of the top speakers on this subject and will interact directly and biblically with the false notion that the modern state of Israel is not prophetically significant. We should have information about the conference on our website very soon if it is not already up. Hope to see you at this year's conference as we provide biblical reasons and information for Christian believers to line-up on God's side by supporting His nation and chosen people, Israel. Maranatha! Some of the most obvious passages include: Gen. 12:7, 13:14-15; 15:18; 17:8; Lev. 26:33, 43; Deut. 26:9; 30:1-11; Josh. 24:20-28; 2 Sam. 7:11-16; Ezra 4:1-3; Psalm 102:13-20; Isa. 11:11-12; 18:7; 27:12-13; 29:1, 8; 44; 60:8-21; 66:18-22; Jer. 3:17-18; 7:7; 11:10-11; 23:3-6; 25:5; 29:14; 30:7, 10; 31:2, 10, 23, 31-34; 33:4-16; 50:19; Ezek. 11:17; 20:33-37; 22:19-22; 28:25; 36:23-24, 38; 37:21-22; 39:28; Dan. 12:1; Hosea 3:4-5; Joel 3:20-21; Amos 9:9, 14-15; Micah 2:12; 3:9-10; 4:7, 11-12; Zeph. 2:1-3; Zech. 7:7-8; 8:1-8; 10:6-12; 12:2-10; 13:8-9; 14:1, 5, 9; Mal. 3:6. Passages include: Matt. 19:28; 23:37; Luke 21:24, 29-33, Acts 15:14-17; Rom. 11; Rev. 11:1-2; 12. Walter C. Kaiser, Jr. "The Land of Israel and The Future Return (Zechariah 10:6-12)," in H. Wayne House, editor, Israel: The Land and the People: An Evangelical Affirmation of God's Promises (Grand Rapids, Kregel, 1998), p. 211. Gary M. Burge, Jesus and the Land: The New Testament Challenge to "Holy Land" Theology (Grand Rapids: Baker Academic, 2010). Arnold Fruchtenbaum, Footsteps of the Messiah: A Study of the Sequence of Prophetic Events (Tustin, CA: Ariel Press,  2003), p. 105. John F. Walvoord, Prophecy in the New Millennium: A Fresh Look at Future Events (Grand Rapids, MI: Kregel, 2001), pp. 61–62. Cited by R. C. Sproul, The Last Days According to Jesus: When Did Jesus Say He Would Return? (Grand Rapids: Baker, 1998), p. 26. John F. Walvoord, Israel in Prophecy (Grand Rapids: Zondervan Publishing House, 1962), p. 26.